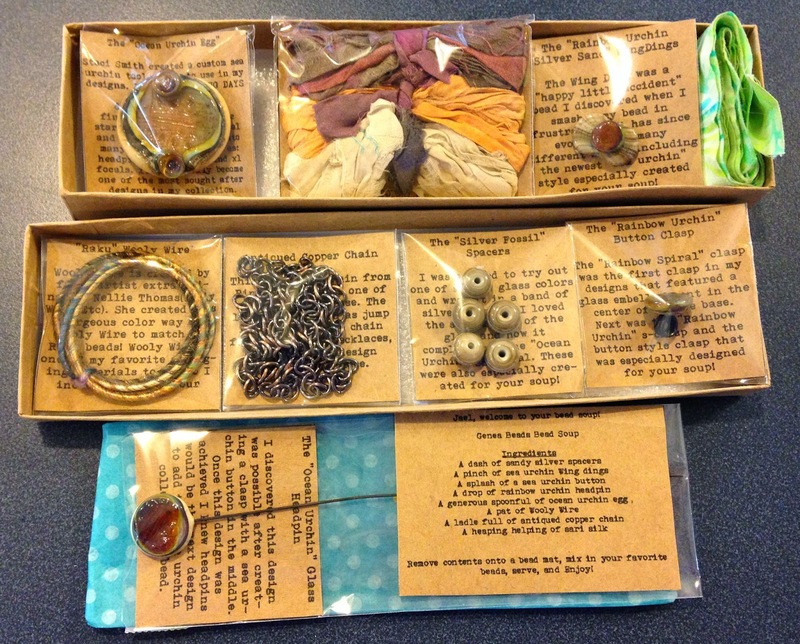 Jael's Art Jewels Blog: The 8th Bead Soup Blog Party is here!! The 8th Bead Soup Blog Party is here!! No matter how I looked at it, Genea's soup screamed "BOHO"!! So I first whipped up a herringbone tube, which I threaded a piece of wire through for stability. At each end are lampwork beads from my stash (made by Patsy Leblanc of Killer Beads). I square stitched a golden bail and hung the "sea urchin" focal from it with a swarovski crystal and some copper spacers. I then hung a MOP leaf from it. Wooly wire is wrapped around the tube and up past the beads. 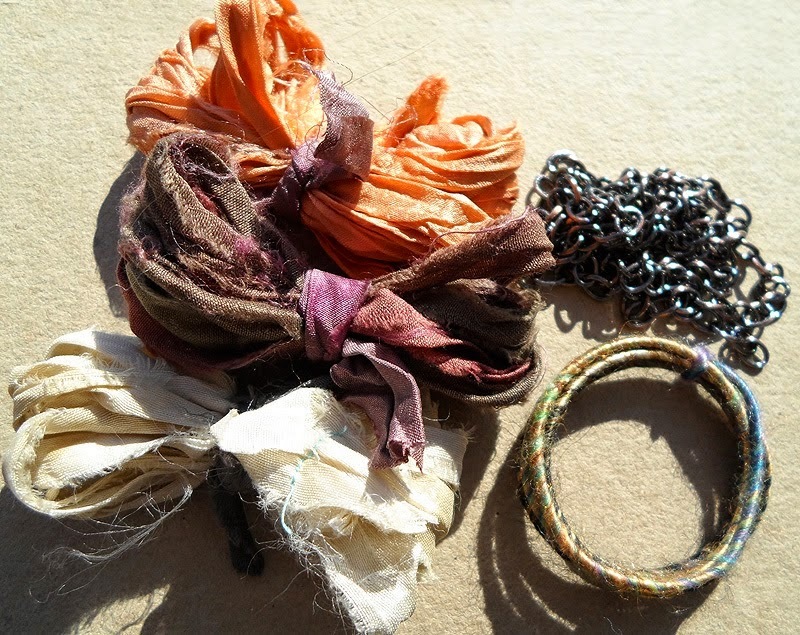 The copper chain Genea sent me is attached to the wire threaded through the tube, and then her recycled sari silk forms the ties at the end so that it can fit any size neck. Next, I created a bracelet using more of the antiqued copper chain. The sea urchin wing ding and silvered ivory spacers were joined by more of Patsy's lampwork, lampwork by Amber Ballard and flat discs, all from my stash. The button closure made by Genea is part of the clasp that holds it together. I love how you stitched up seed beads for the necklace cord and bail and the used wooly wire wrapped around it! Very creative! The bracelet is AWESOME! I love the dangle design and the clasp finishes it up perfectly! I am in love with that bracelet!!!! It is absolutely gorgeous! You did a wonderful job with your soup. Wonderful conception based on the soup your were given. I agree that it practically screamed "Boho" and you certainly brought that to life. I like your colorful backgrounds in some of your pictures too. A brilliant success! Yep, totally agree with you, they do say 'boho' don't they? Think you did a great job! Jael - So awesome! The necklace is beautiful boho and that bracelet is sooo gorgeous (I'm coveting it, truly!). Me again - how did you like the wooly wire? Have you used it before? I've been intrigued by it but have never used it. Just curious it - it looks awesome! I love your herringbone with wooly wire, so clever! beautiful pieces!!! Love the beads from Genea! You've made a beautiful soup with her beads. The bracelet is totally charming, Jael! That bracelet is Fantastic! Well done. I love the Boho Style of all your pieces!! Beautiful work. A lovely meshing of Genea and Jael! Wonderful creations from your soup! Love the necklace you created and the bracelet is fabulous! I enjoyed working with the wooly wire - there are so many things you can do with it! Just gorgeous! I am totally in love with the bracelet. I bet that it has a lot of movement! Beautifully Boho. That pendant is awesome and the necklace cord really sets it off. wow! that necklace is awesome! Jael your designs are unique and very creative. Beautiful work. Sweet!!!!!!!!!!! Great job Jael's always enjoy looking at your beads too! I like the earthy look to that necklace. Great! Love that bracelet...actually love both designs...gorgeous, gorgeous, gorgeous! Beautiful necklace, Jael! Love it! I didn't know you're good also at beadwork! And the bracelet is so cute with all that dangles!! Fabulous use of your soup. Lovely designs. First, I want to say your blogger header makes me salivate and rub my hands together and try to figure out how to buy all those goodies! You did a smash up job with Genea's beads! I love how her style has evolved (you should see the COOLEST bead I bought from her at a show last year!) and boho works great. I had to laugh when you said you just "whipped up" a seed beaded bit.... I would have whipped the beads out the window, I'm so hopeless with that! I love the addition of the Wooly Wire (I have some but haven't used it yet) and well what can I say -- everything you do is golden. The herringbone weave was just the right touch and the bracelet with all those yummy beads are to die for! Love and admire your design!! Both of you pieces are gorgeous. I really like how you combined the herringbone stitch and the wooly wire. And the bracelet is a treasure trove of beads. Just wonderful! I love how you just "whipped up" the herringbone tube. :) You make it look so easy. Wonderful! The bracelet! The bracelet is a show stopper. If I wore it- I would constantly be swishing my wrist to feel it's movement and sound. Everything is beautiful- great job! Gorgeous designs, I especially love the herringbone tube and wooly wire in the necklace... the bracelet is simply beautiful! The herringbone cord wrapped with the wooly wire is such a great idea! Love your bracelet too! That necklace is perfection... interesting elements, but the neutrals really allow the glass pieces to pop beautifully! oh yum! what gorgeous work, on both the necklace and the bracelet!! What beautiful things you have made, I like the idea of wrapping the wooly wire around the cord on the necklace very interesting. Your bracelet is just lovely. I hope you will be able to visit my blog if you get a minute. Love the textured created by wrapping the wool around the Ndebele rope. Need to remember that idea for the future. Both your pieces are lovely. The bracelet rocks - gorgeous. Love what you did, esp the bracelet! You had an amazing soup and you made it sing, Jael :) Everything is GORGEOUS! Great design of the necklace, unique. And the bracelet is playful beautiful. Great work. The glass beads and design complement each other very well. 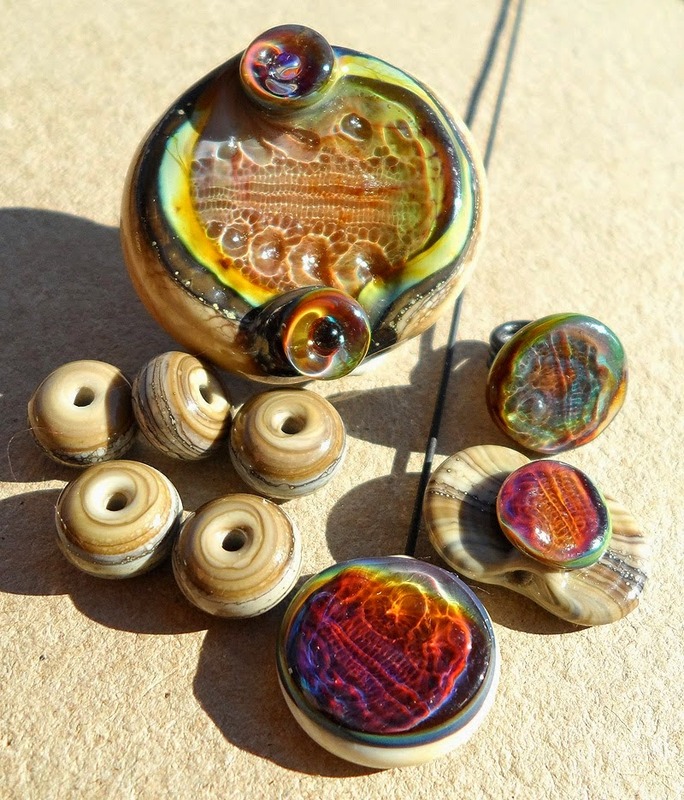 The button clasp closure on your bracelet is fabulous and the lampwork you added makes is sumptuous! I have seen wholly wire and think it is gorgeous but it scares me!! You did an amazing job with your soup! Love the "charm" bracelet and I really love the way you combined techniques in your necklace! Love the wrapped herringbone tube, such a clever idea. The bracelet is absolutely stunning too. You betcha that's a Boho soup! Clever approach with the necklace - I love how it turned out! And the bracelet - SO full of color and movement. I imagine you're pretty proud of yourself, right? (you should be!) Well done! first necklace- all in great one-fafic, seed beads, lampwork-super compilation! bracelet-stunning! I'm lusting after that bracelet1 Gorgeous! Very cool!!!! I love the bracelet!! I just love how you "whipped up a herringbone tube" to use in that first necklace. I'm always so impressed with when designers crochet seed beads and make kumihimo. The thick accents rally sets the piece apart. Nice job with all of it! i love the focal necklace! so pretty and rustic and the same time. incredible work! The bracelet is amazing! It's my absolutly favourite. I loeve the combination of silverd ivory striger beads, silverglass beads and copper. It works so well together. Absolutely beautiful. I love the variety of pieces and styles. amazing work! Very lovely work, Jael. I'm totally in love with the bracelet.....composition, colours, style........everything about it speaks to me.Thanks for sharing. I love your creations and I love your hand-made beads. I want to buy some to incorporate into my designs. Gorgeous. The beads are gorgeous and you so did them justice, great job! The necklace is stunning with the beads you received and the herringbone stitch piece! Love the bracelets as well! Wow...all your pieces really rock! I don't know that I could pick out a fav! I tip my chef hat off to you! Your pieces are great. I really like your use of the wooly wire in the necklace. It really adds some texture and even more interest to the beautiful necklace. Awesome job. You certainly added a lot of texture and interest to the focal in the necklace - the beaded components and the wooly wire together look fabulous! My favorite piece is the bracelet with so many beautiful and diverse dangles! Beautiful everything! I especially love the way you wrapped wooly wire around the herringbone rope. Love the texture. I'll be back to visit!